Vendors set up along the sides of the Barney Allis Plaza, selling handmade goods. 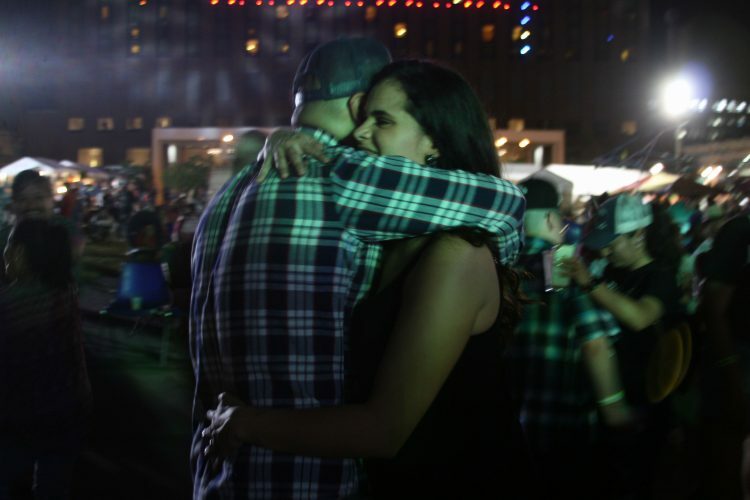 Kansas City’s Fiesta Hispana was held Sept. 14 through 16 in the Barney Allis Plaza at the Kansas City Convention Center. The festival is the epicenter of Hispanic celebration in the Midwest, bringing in upwards of 40,000 people each year. Attendees of the festival enjoy Hispanic culture in the form of dance, song, crafts and food. The foundations of Fiesta Hispana were built in 1972 after President Richard Nixon executed the Hispanic Employment Program. The program inspired a few Hispanic employees in the Kansas City area to partner with the Greater Kansas City Federal Executive Board to arrange an event to celebrate Hispanic culture in commemoration of National Hispanic Heritage Week. The first incarnation of the event included several individual celebrations in federal job sectors and the event expanded to the broader community in the form of a parade beginning in downtown Kansas City and ending in Armourdale, Kansas. In 1981 the parade was extended to include a fiesta, which was held in Kansas City’s Southwest Boulevard until the celebration eventually moved to the Barney Allis Plaza – a new area to Kansas City in 1983 – in order to provide space for the growing number of attendees. The parade was discontinued due to federal funding cuts – still, the fiesta prospered, garnering 10,000 attendees in 1984. 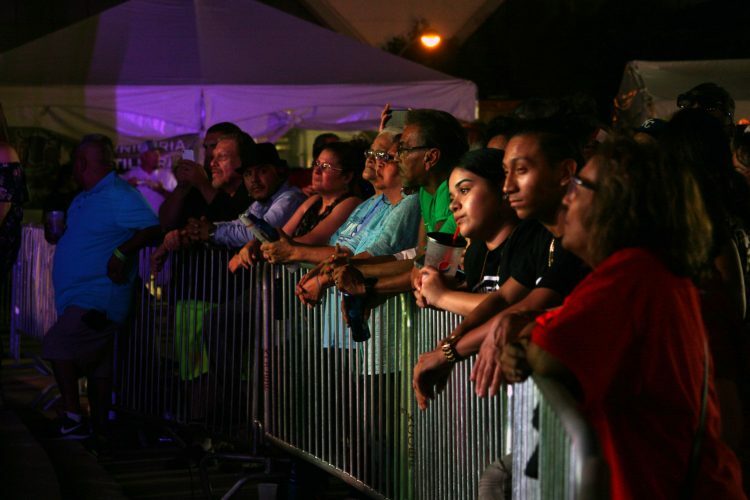 The festival grew over the years to regularly attract over 40,000 visitors of varying backgrounds to celebrate Hispanic culture during the mid-September weekend. 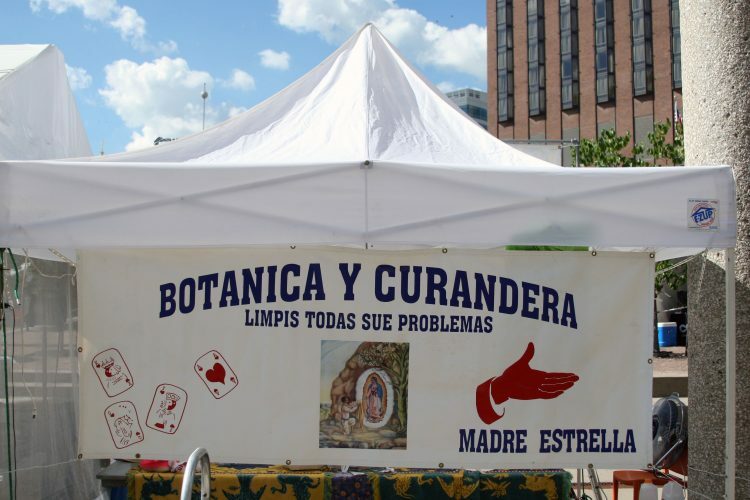 Fiesta Hispana appeals to people of all ages, offering a children’s play area along with various children’s activities and a rich assortment of nighttime activities like dancing, drinks and live music for adults. A performer dances during the Fiesta Hispana. A couple dances during a band’s performance. Crowds lined up to see different bands play all weekend long. The fiesta features various forms of Hispanic entertainment – including traditional Hispanic dance groups, Mariachi bands and solo singers who perform on a stage at the plaza’s center. 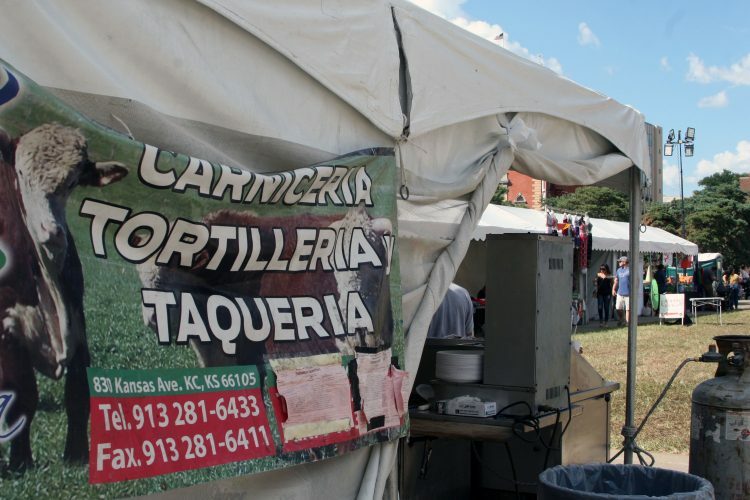 Some local vendors sold authentic Hispanic cuisine of many sorts – from flautas to margaritas. 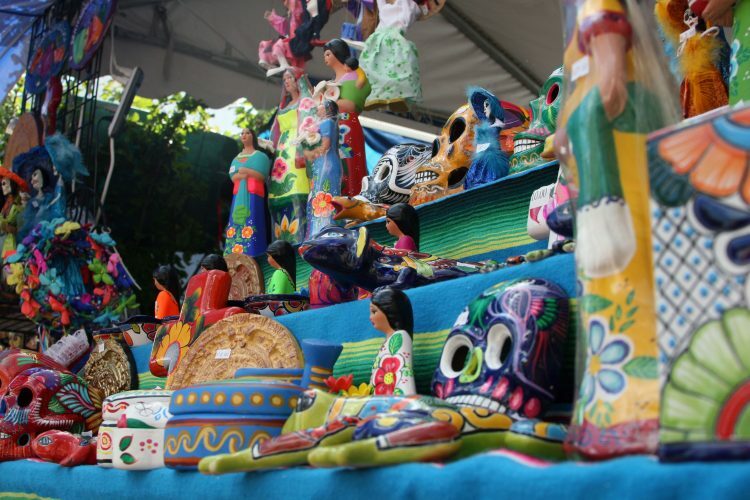 Others sold traditional Hispanic arts and crafts, such as jewelry and clothing. A psychic advertises her services. Restaurants offered tacos, carne asada and other food items. Advocacy groups spoke to passers-by about several topical issues concerning Hispanic people in the nation. The Association of Latin American Students (ALAS) at the University of Missouri-Kansas City (UMKC) set up a booth for the purpose of representing DACA DREAMers. ALAS unites students of Hispanic backgrounds at UMKC in solidarity to celebrate their culture. 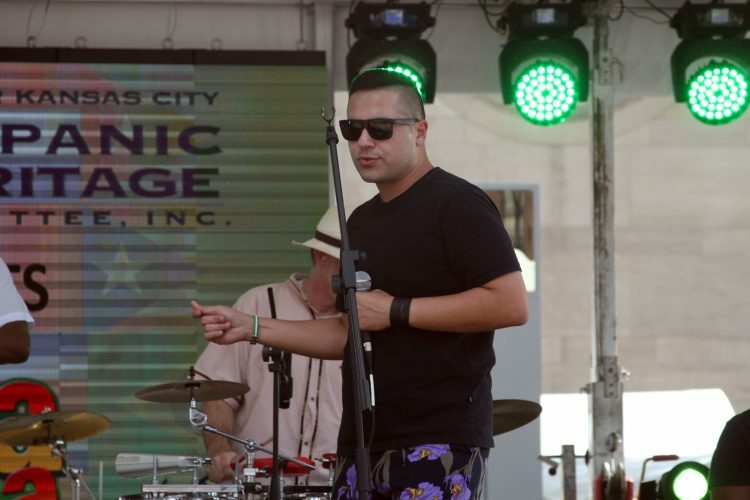 Gabriel Calderon, vice president of ALAS and second-year student in UMKC’s six-year medical program, represented the group at Fiesta Hispana. He spoke about the purpose of the group on UMKC’s campus. “What we do is we try to bring Latino students together at UMKC because a lot of times many Latinos feel disconnected and don’t feel like they’re at home with the familia and so we try to bring some family to them,” said Calderon. UMKC students junior Maria Franco and second-year medical student Gabriel Calderon. Both are a part of UMKC’s ALAS. According to a 2010 census, approximately 10 percent of Kansas City’s population is Hispanic. This demographic has continued to grow over the decade. As this community expands, Fiesta Hispana and the organizations that facilitate it are providing a means for congregation for and appreciation of Latinos and their culture in the Kansas City area. Photos courtesy of Cassie Hayes.